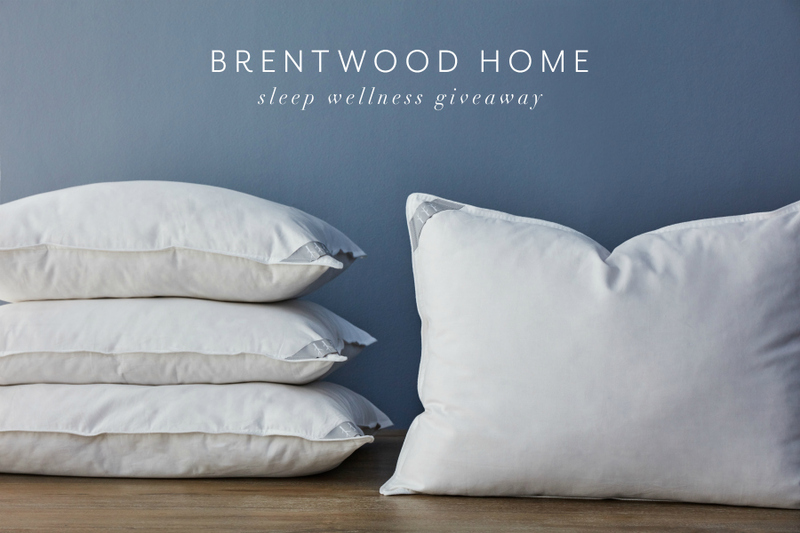 This giveaway is brought to you by Brentwood Home and does contain affiliate links. We were sent the same bundle that I’m giving away below, but all opinions are my own. My husband has had trouble sleeping for years. He simply can’t find a position that keeps him feeling consistently comfortable throughout the night. 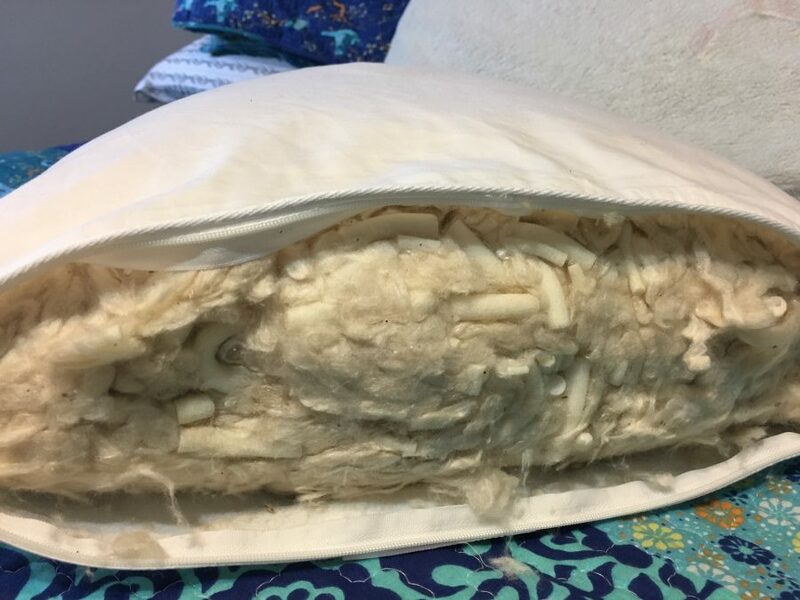 So it was pretty incredible news when he declared, after the first night sleeping with our new pillows from Brentwood Home, that he had slept more soundly and more comfortably than he could remember doing for years. Sleep matters. A good night sleep sets you up for being productive during the day, for getting more done. When I start my day with a sufficient amount of restful sleep, then I get more done, I have a better attitude, and I am a happier person. In contrast, a restless, short, or interrupted sleep usually sets me up for a grumpy, distracted, unproductive day. As we approach another January (I’m still in denial that 2016 is over!! ), I’m thinking about my goals for the coming year, as I usually do at the end of December. One of my goals, year after year, is to get better sleep. There are so many things I can do to improve my sleep – from setting a bedtime for myself and sticking with it to getting better pillows to support my neck and back. Luckily, Brentwood Home sent us each two new pillows that are helping us with a big part of our “better sleep” goal. We each received a Helena Latex Filled Pillow and a Carmel Latex Pillow. The Carmel pillow is the perfect amount of soft firmness for my head and neck, and the Helena is ideal to support my back while laying on my side. I love that the Carmel is a firm, formed pillow and the Helena is a soft, plyable pillow. They work so well together! 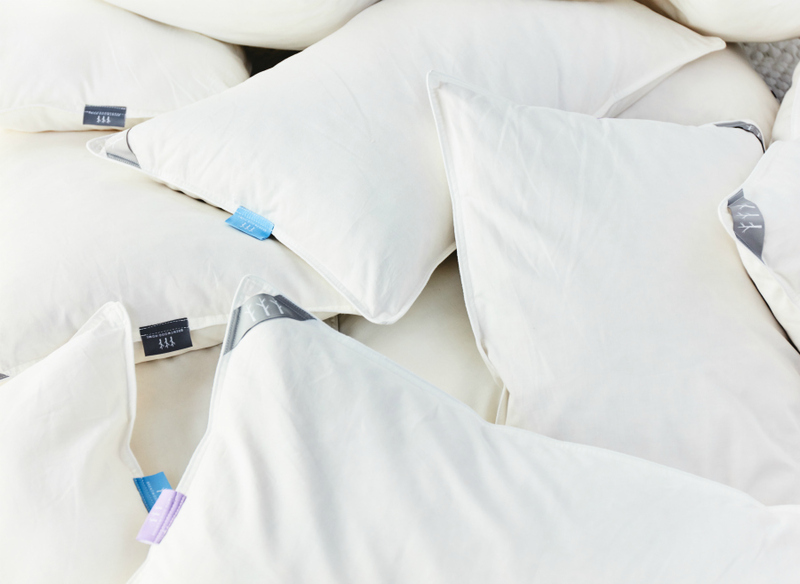 Helena Latex Filled Pillows – Filled with a combination of 100% natural latex ribbons and silky-smooth kapok fibers, this pillow is both fluffy and supportive. This is my ideal cuddle up, huggable, lean-against kind of pillow! 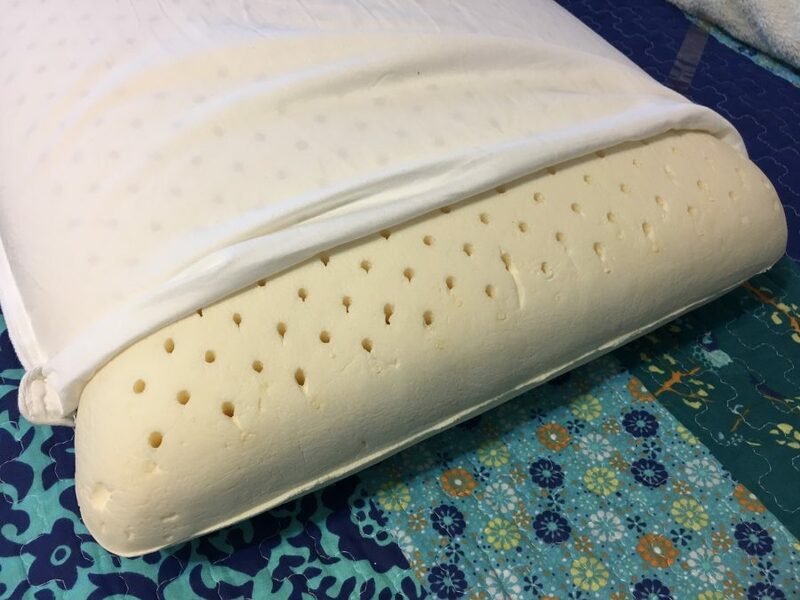 Carmel Latex Pillows – Made with 100% natural latex, the Carmel pillow is ideal for those in need of a firm, supportive foundation through the night. This is my ideal under-the-head supportive pillow that makes my neck feel amazing! Check out all of the bedding – from pillows, sheets, quilts and more – that Brentwood Home has to offer! Brentwood Home is committed to create the most comfortable and most natural sleep products as possible to give you your best night’s sleep. Click HERE for a coupon for 10% off the entire store! One winner will receive FOUR new pillows: 2 (two) Helena Latex Filled Pillows and 2 (two) Carmel Latex Pillows. Enter to win these four amazing pillows, worth a total of $276, on the giveaway widget below. This giveaway is courtesy of Brentwood Homes and will run through January 4, 2017 at 11:59 pm ET. After the giveaway is closed, a winner will be selected at random and notified via email. Residents of the US only, please. Good luck….and good night, sleep tight! I take a hot bath to relax! I stop drinking anything with caffeine right before dinner. It helps immensely! I commented on your “SNICKERS STUFFED PEANUT BUTTER COOKIES” recipe post. My mouth is watering looking at the pictures and I pinned the recipe so I can reference it because I am definitely going to bake these bites of deliciouness! I change my sheets weekly and crank up the humidifier daily. Nothing like fresh sheets to get you to sleep. My best tip is to unplug yourself from technology and read until your eyes get heavy. Never bring a phone or tablet to bed. I commented on your “DIY LAUNDRY BOOSTER CRYSTALS” post. I love this idea! My best tip for getting better sleep is to take approximately 10-20 minutes to wind down and relax prior to getting in bed. This allows your muscles and brain to relax from the tensions/stress of the day. Plus no caffeine before bed and no TV while sleeping. I like to plan it so that before I go to bed, I can calm myself and my body down enough with tea (preferably chamomile with honey), light reading from a book, and a short period of breathing in essential oils from my diffuser. This really seems to relax me and make sure I’m ready for bed; it also helps to have this routine because once I begin the routine every night, my body knows it’s bedtime! Sleep is my enemy because I work 3-11 and I have to get up with the kids for school at 5:30am. I try to go to sleep at least an hour after I get home. I always sleep in on the weekends and days off. Eight hours would be great, but it rarely happens. No using electronic devices in bed! My tip is to not eat right before going to bed. Thanks for the chance to win! My best tips for a good night’s sleep are to invest in a good pillow, and avoid caffeine in the evening! I tend to sleep better if I have a really warm blanket but I know a lot of people can’t sleep if they’re too hot! Sending the kids to grandmas!!! Really! I like to read “from a book” not my kindle for a while before going to bed. It helps me relax. My best tip to a good night’s sleep is to avoid caffeine in the evening. For better sleep, avoid screen time for about an hour before bedtime. I put a little lavender oil on my pillowcase. Keep the cell phone out of the bedroom. A tip for getting a good nights sleep is to stick to a nightly routine/schedule because changing the time you go to bed can mess up your circadian rhythm..
My best tip is to either take a nice hot shower or bath, get into cozy jammies and have a night cap.. works every time for me. I have learned that the cooler the room is, the better I sleep. I even keep a quilt on the bed in the summer so that I can snuggle down in the covers. I like to have a warm cup of hot chocolate or just warm milk, before bedtime. This helps me sleep, better. But, mostly, a really great, comfortable bed pillow to rest the whole night ! I make sure and turn off my laptop and tablet about an hour before I go to bed. Then I make some chamomile tea and read a book. turn off all electronics an hour before bed. sleep in a dark room..no lights. For me I like to use a heating pad to help my aches and pains at the end of the day. And a few pillows! Keep on schedule. Go to sleep at the same time every night. I have to sleep in a dark and cold room. I have to have noise and a fan. One of my best tips is to read. That tends to relax me. I have a fan running and use black out curtains. Turn off the tv and other sources of blue light about 20 mins before going to bed. Do a work out about 3 or 4 hrs before going to bed. For me, one of the keys to a good night’s sleep is a quiet, dark room. That means not leaving the TV on–the sleep timer is my friend. I don’t really have any tips other then I like to take a shower before bed and listen to music. Don’t have a TV in your room! We banished ours 10 years ago. makes a big diffrence. One tips for getting better sleep is have the right mattress. I diffuse lavender to help me sleep. I have been working in the emergency room so often I have trouble sleeping. I do like the room to be dark and cool, I can’t sleep in a hot room! I think being in a dark room is very important. I also like to read right before bed. It calms me down. Make sure to have a dark room, and keep your bedroom cool. It helps you sleep good at night. My best tip is sleep with all lights and tv off. I sleep best in pitch black dark. I like to sit in a quiet room until I get tired. I enjoy a hot cup of tea before bed and make sure everything is off at bed time. One of my best tips it to take a long bath and get into some comfy pj’s with a good book. I usually sleep like a baby afterwards. My tip is to read a book before bed. I always fall asleep while reading for some reason. I suggest reading before bed with a low light, when you are in front of a bright tv, bright lights to brush your teeth, bright tablet or laptop screen, it makes falling asleep harder. My best tip is to stop eating at least an hour before you plan to go to sleep. I don’t use electronics right before bed. Don’t have kids! No seriously, turn off all technology including television at least half an hour before going to bed. Don’t even bring tech into the bedroom. My sleep habits are terrible, but I find if i don’t eat late at night I can fall asleep faster. A cup of tea and soothing music helps me. A nice cup of hot herbal tea helps me sleep better, especially chamomile. I wish I had a best tip for getting a good night’s sleep. I used to be able to read a bit and then fall asleep. Since perimenopause kicked in, my sleep cycle is completely disrupted. I’m hoping these pillows will help!